Nanny2Mommy - Hostess with the Mostest! very cute blog background too! have a great day diana. actually, i should have said host (not co-host) thanks again! Love this! New follower. Going to link up right now. 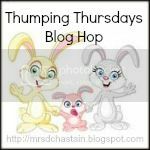 I'm linking in a little late today--but, I still have time to hop! Have a great day--and weekend too if I don't make it by tomorrow!